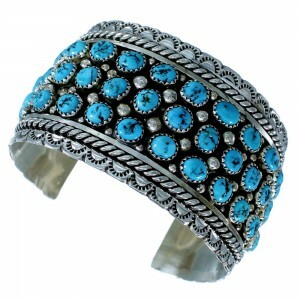 The inner bracelet circumference measures approximately 5-7/8", plus a 1-3/8" opening, and 1-5/8" at widest point. 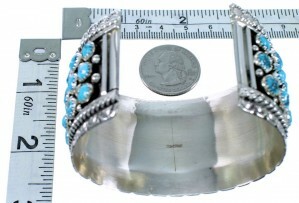 The bracelet weighs 86 grams. 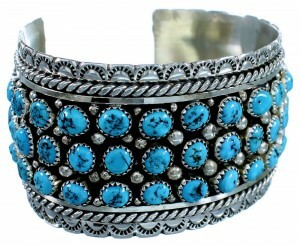 This lovely bracelet is a work of art and has everything you could possibly want from a piece of Native American jewelry! 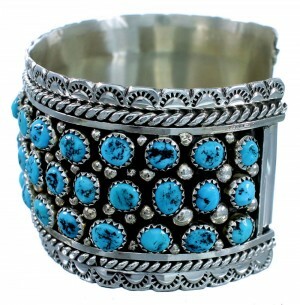 This piece of Native American jewelry is Navajo hand crafted by artist Tina Jones, out of genuine sterling silver and real Turquoise stones. 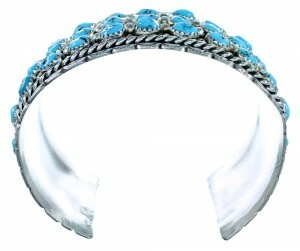 A total of FIFTY THREE Turquoise stones are carefully placed in hand cut bezel settings, while being accented by twisted silver, mini silver beads and imprinted designs for a splendid finish. The bracelet is stamped sterling.